New Feature: User can now select the animal to be tested. No lights to watch! No buttons to push! A fast, safe and accurate ultrasonic pregnancy detector for swine, sheep, alpacas, meat & dairy goats, pygmy goats, llamas, large rabbits, foxes, and numerous other mammals over 8 lbs. Identification of feed-wasting non-producers and low producers at very early stages. Confirmation of pregnancy in animals purchased or sold. Savings resulting from increase in overall operating efficiency, permitting more efficient use of expensive farrowing installations. The patented PREG-TONE uses high frequency sound waves called ultrasound to detect amniotic fluid present during pregnancy. When this fluid is detected, the instrument produces a loud continuous tone. When used on an animal which is not pregnant, the instrument produces an intermittent recurring tone. The intermittent tone also indicates that good skin contact is being made. 100% accuracy between 30 and 45 days depending on the animal type. The PREG-TONE has been tested against other ultrasound instruments by leading universities throughout the world. 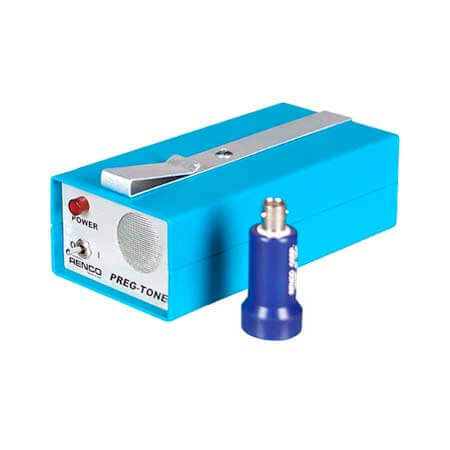 Their studies show the PREG-TONE as the superior instrument, in both accuracy and ease of use. Swine: Testing may begin as early as 18 days (large litters, 11-12 piglets, will show positive at this stage), and open sows can be diagnosed as early as 30 days. Normal testing time in sows and gilts is 30-73 days. Sheep: Using the position shown above, pregnancy testing in ewes can begin at 35 days with most diagnoses made by 45 days. Testing can also be done in the normal standing position, providing diagnosis at 60-65 days. Goats: Testing may begin at 30-40 days on the right side. Put oil on test site. Probe is placed 2 in. (5cm) in front of the rear leg and 1-in (2.5cm) above the teat. When probe is in good contact, the intermittent tone will be heard. Aim probe 45° upwards and forwards i.e. towards the last rib. Scan across the uterus. If pregnant, the tone will turn into a continuous tone. Dairy goats such as the Oberhasli can be tested as early at 20 days. Alpacas: Testing can begin at 30-40 days. Alpacas and llamas are tested on the left side. If unsuccessful, try the procedure on the right side. Place probe 6-8-in (15-20cm) down from the udder. (On maidens about 5-in (12cm)). Point probe straight into the abdomen at an angle defined by the shape of the abdomen. Uses only loud, easy to hear tones. During testing, no lights are used, no buttons are pushed, thus attention is not diverted from the animal. A short, intermittent tone indicates good contact, while a loud, continuous tone indicates pregnancy. Since the PREG-TONE uses only loud, easy to hear tones to indicate both pregnancy and non-pregnancy, it can be clipped on the belt or kept in a pocket. The PREG-TONE does not need to be seen or held during testing. Rechargeable NiMH batteries. Low battery indication. Rugged all-metal construction. Small enough to slip in your pocket. All-metal construction guarantees against interference by radio waves in the atmosphere, a major accuracy problem with some ultrasound instruments. It is constructed of heavy gauge aluminum for ruggedness and ease of cleaning, yet the PREG-TONE is still lightweight and small enough to slip in your pocket.